Welcome once again to Tea Cup Tuesday with Martha (from Martha's Favorite's) and myself. Martha and I met online and soon discovered that we both loved and collected tea cups. O.k. Martha collects a few more thing other than tea cups (tongue in cheek...lol!). Martha really knows her stuff and she has lovely taste. So we hooked up this party together and have been hosting it for quite some time now. Martha usually tells us what number the post is, she is good at that too! Since it has been a glorious spring here and strawberries were ripe for the picking for the first time this year just last Saturday.... I am dedicating this post to a few cups I have that showcase berries and fruits! Isn;t this cup just darling??? I love the gold design, almost a paisley. And the berries, fruits and roses in the cup....so sweet! The plate has a slight scalloped edge, and the cup itself has a regally flared sides as well. 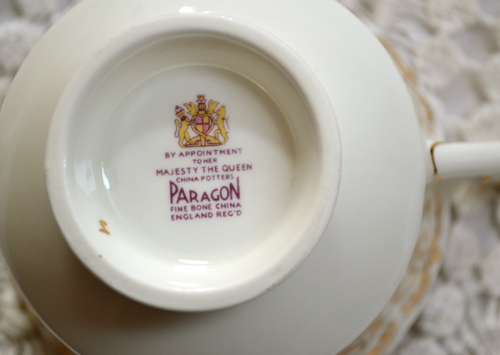 You may or may not have guessed that this cup was a Paragon...I didn't when I first spotted it in an antique shop. I flipped her over to see she was from one of my all time favorite manufacturers. 1957-1963 is an approximate time frame for this cup. Here is a lovely trio that I was lucky to find in England a couple years ago. Inside the cup we are treated to a bountiful harvest of a variety of delicious berries! 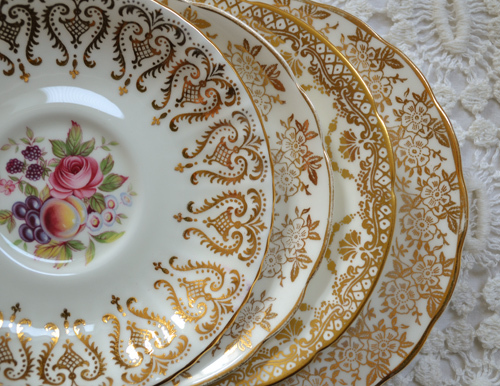 This trio shows off a beautiful floral gold edge design, it looks like they are apple blossoms. I do not know the manufacturer of this cup. 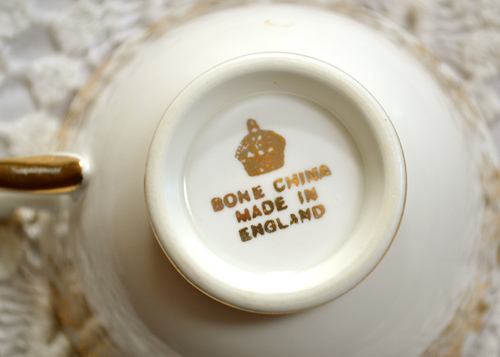 There is only a gold crown and Bone China Made in England. Do any of you know about a mark like this one? My final cup for today is this very dear sweet cup! I love the elegant simple split loop handle with what I call a mercury wing top. Just a personal reference. Some are more detailed and look like a wing. The plate is well adorned with more flowers, berries and even what looks like an apple. She is one of my all time favorite cups. Paragon created her as well. I am thinking this backstamp is from the 60s. All of these beautiful cups look good together and make me want to create a torte with the freshest berries and fresh cream! 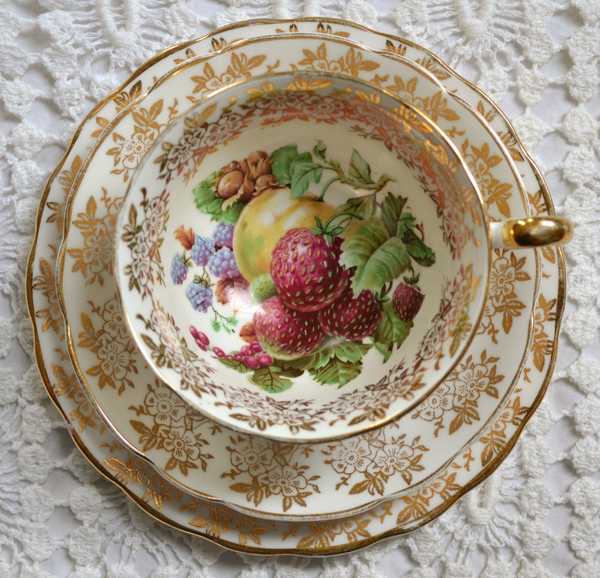 And serve them with pretty gold plates and hot cups of delicious tea! I have loved having you over. 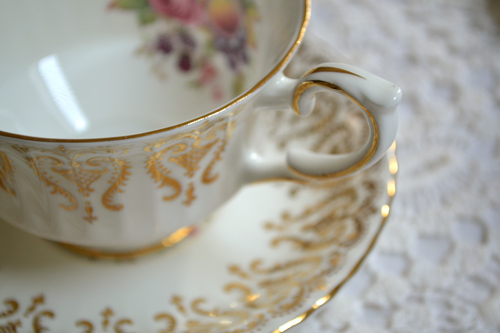 If you would like to join in and share a tea cup of yours, just go and create a post about your tea cup (we love seeing a pic of the backstamp too! ), then come back here and link your post to Linky Tools below. Martha and I will love to come and visit you! 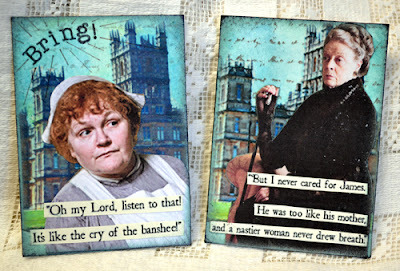 Downton Abbey ATC swap, sing ups will end April 12th and ATCs will be due to me by May 12th. Then I will swap them all out with you. If you wanted to join in and I don't show your name, please e-mail me or comment again below. And if you just heard and want to join in, leave a comment and a way to reach you. 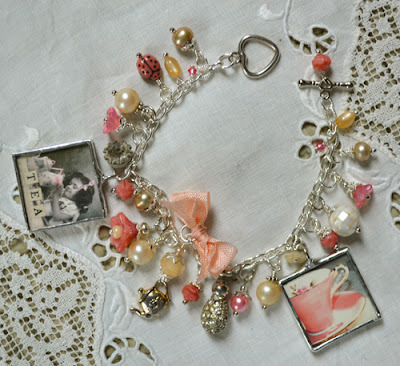 A tea bracelet, with two of my tea cup images photoshopped to look more like watercolors. Still a little more to do on this one for better balance. And this is the second tea cup image. 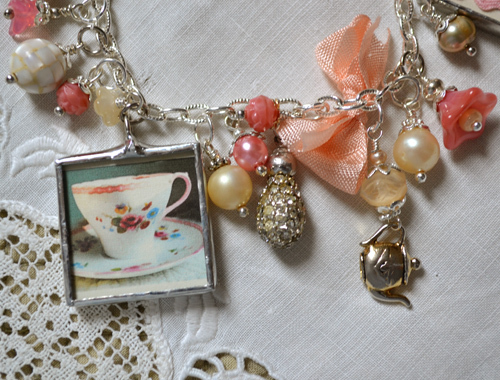 I used vintage beads, charms and pearls. I have learned much already soldering. Not hard when you are coming up from no idea what so ever! Lol! My next post I will share about the process I have gone through and the progress I have been making : ) Yay! I am only practicing my technique, I really don't even have an idea of "my style" yet. Here I am tried old post cards, children's books, lace and an old font book. I like using images from vintage books, instead of photocopying them. I think it is a texture thing. Thank you so much once again for stopping by! First - your Paragon set is stunning, it is absolutely beautiful - every single detail! And your crafts you are making, wow they are amazing! One cannot tell you are just learning? I am SO impressed! They are lovely! You are so right...that beautiful, detailed gold fillagree is stunning, and goes perfectly with my white and gold cups...I have five matching ones.....currently my favourites! Love the gold filligree! So beautiful and so elegant!! you have chosen three beautifully designed tea cups of your collection. They are so similar in the gold filigree, so they make a wonderful set. I love the fruit details. Your bracelet ist just charming. I am also very impressed about your skills and I am so curious about the details, how to solder. Thank you for sharing your wonderful china, your skills and for hosting this event. Dear Terri, such lovely cups,,they will make the most beautiful table setting, and with a strawberry cake on the plates, it would be like a dream . And how much you have been creating, >I love all your soldered pieces, and the wrist cuff is absolutely wonderful. I will love to see how and what you did to make them. 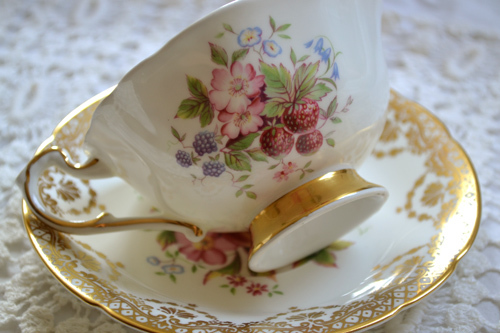 Your berries & cream teacups are fabulous and look so well together as a set. Love all the filigree. Your jewelry is very pretty. Thank you for hosting. yummie strawberries... but here it is not the time yet! The cups are so nice... 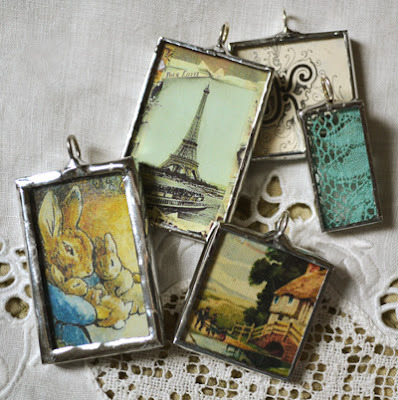 But I am looking forward to the workshop how to make the beautiful charms you made. The bracelet is just gorgeous!!! Love your soldering - I learned this a few years ago, and have started up with it again, it's fun!!! Drop by for tea if you get a chance. 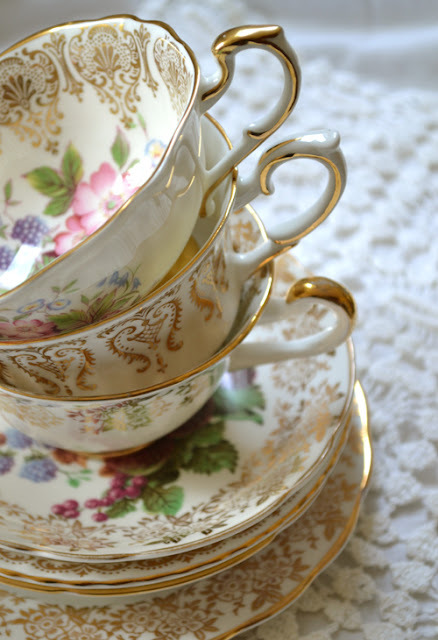 How do you manage to uncover all these gorgeous tea cups you share with us? Although similar, perfect to be used together, each one of them has some exquisite detail that makes it unique! Thanks for this beautiful and artful tea. 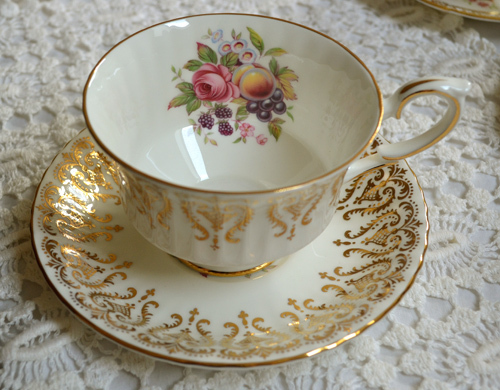 Oh my, how gorgeous are your teacups! I think they look fabulous all stacked! I love cream and gold; so ornate. The last one is especially pretty! 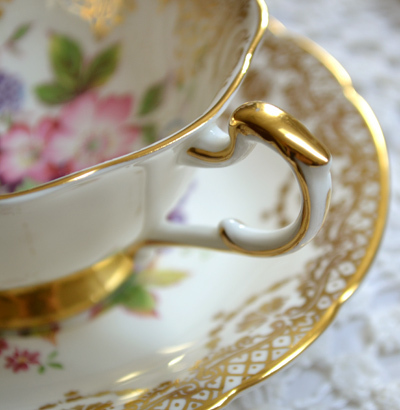 You really do have a beautiful collection of teacups! Thank you for sharing your pretties and have a Happy Easter. Beautiful post! Your teacups are stunning and I love your charm bracelet. I have always wanted to make one but have never soldered. Thank you for sharing. 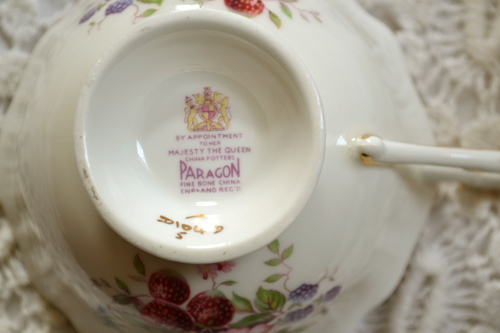 Your Paragon tea set is just amazing! I love all the gold and the beautiful, delightful fruit. They are wonderful treasures. Your tea bracelet is a great creation! You have chosen very beautiful items for the charms. Your taste is splendid and I know your style will be amazing. Looking forward to seeing more. These tea cups are exquisite! Berries and cream ... I think I'm in love! :D :D Happy Tea Day! 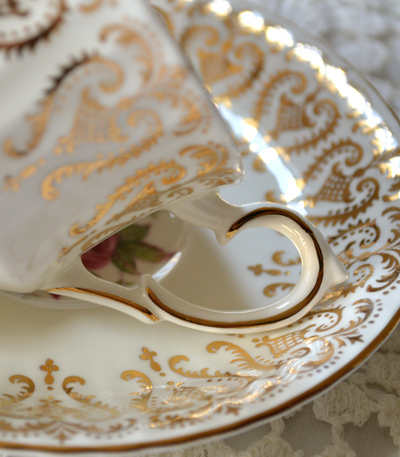 That teacup is gorgeous, I love china with gold trim! Your jewelry is looking wonderful as well, tfs. This is such a beautiful pattern, so elegant! I love the fruit and flowers and lovely boarder. Your style is always beautiful. Your work on the soldered pieces is exquisite. Terri, those teacups are some of the prettiest you've posted. Although I think that with each Teacup Tuesday post. I've tried soldering in the past, and so I can say from experience--Well Done! I found it quite frustrating, as mine were always gloppy. Lastly, I haven't seen Downton Abbey, but if you decide to host another ATC swap, I may join in. Your artwork brings me joy! Holly M.
Terri - Your teacups and talent consistently awe me! Always leave my visits with you so inspired! Some major changes in my working life leave me with some much sought after time that I just might get to indulge in my own artistic pursuits - finally! And, maybe add Downtown Abbey to my list of things to do - haven't had the time . . .
Terri, your tea cups are stunning! I have several fruit and berry cups that I had collected years ago! I love tea cups but I wanted to collect one that were different from the other collections that I have seen, so I thought fruit would be perfect! Your post made me want to go and pick out one of the beauties from my collection and have that perfect cup of tea! Thanks so much for the inspiration! Beautiful teacup Terri and beautiful photography! Thank you for hosting and have a blessed Easter! Wow what a fun newsy post! 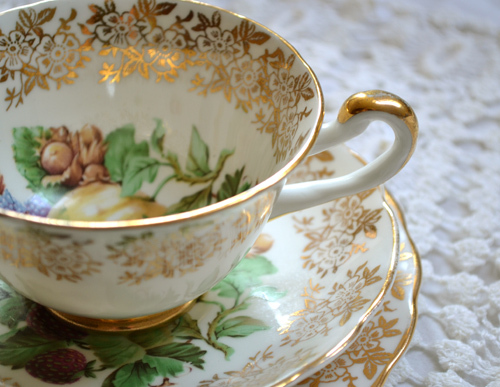 Just love the teacups with the gold. They are so gorgeous! And you photograph everything so beautifully. You've been busy! Glad you're having fun. I love your teacup collection. The fruit and flower design is beautiful. Thanks for hosting. Have a blessed Easter. 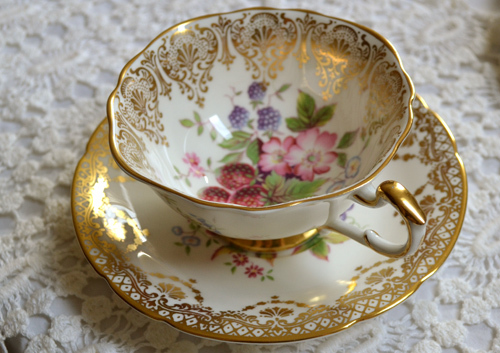 Beautiful teacup ...I'm swooning over the floral detail!!! Uuauu que xicaras divinas, desenho interno é fabuloso! belo exemplar Bone e paragon! belas joias criadas com postais e recortes! 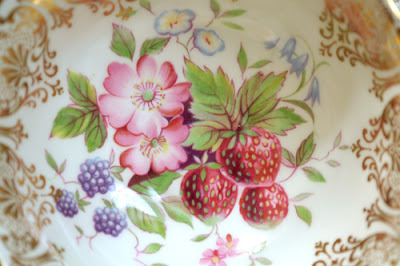 So beautiful Terri..another fabulous post..and such a gorgeous inspiring cup and pattern! beautiful creations..you are super talented! Wonderful work! !They are all so gorgeous! Beautiful tea cup, Terri! And I LOVE the bracelet! I'm sorry I haven't stopped by in quite a while. Your blog is always so lovely!! Have a wonderful rest of the week! Thanks 'first and foremost' for your kind words of, 'welcome back' and well wishes over the past week. 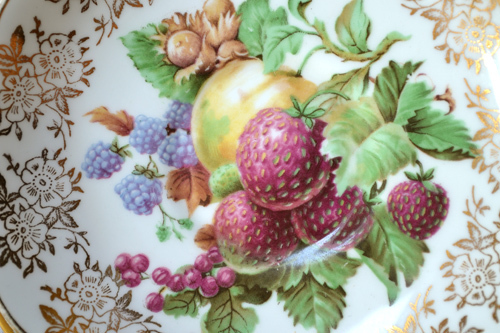 I love your exquisite teacup this week, as always.., The fruit motif is spectacularly pretty. Have a blessed, safe, happy and fun Easter weekend and thanks for hosting. Terri, your tea cups are soooo lovely. I get so excited when I see a "surprise" image at the bottom of the cup ~ such fun. The gold and cream combos are very elegant! Your soldering is wonderful. I have yet to try mine out and hope I can be as neat and careful as you! 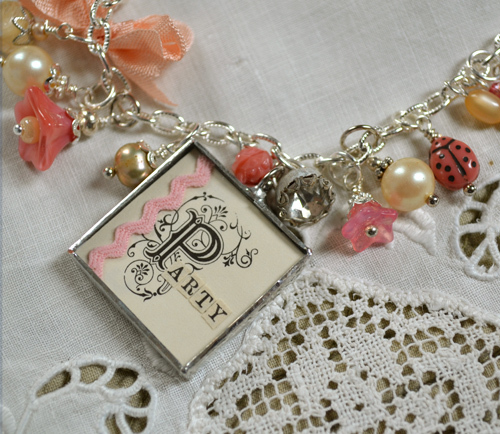 Your charm bracelet is perfect and really embraces the theme. Keep calm and solder on! Love, love, love the photo of the saucers all together. 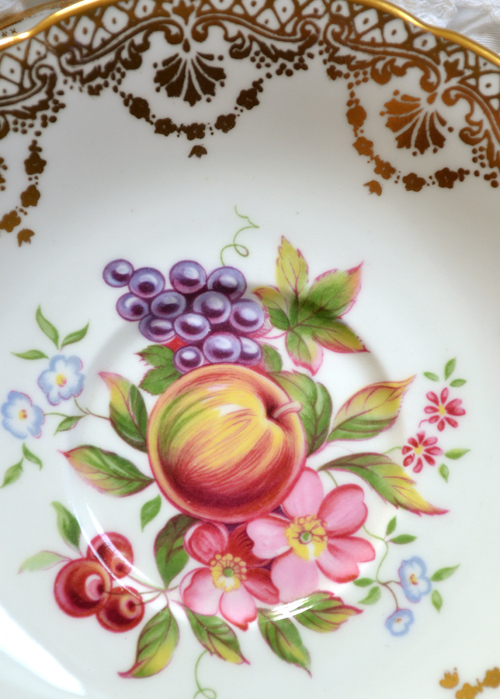 Vintage fruit graphics are one of my favorite things, but mixed with flowers they are even better. Wheat an excellent collection!